DA Form 7450 or the "M2 Caliber .50 Heavy Barrel Machine Gun Firing Tables Iii(a) And Iii(b), Night Practice Scorecards (mounted Or Dismounted, Prone Or Fighting Position)" is a Department of the Army-issued form used by and within the United States Military. The form - often incorrectly referred to as the DD form 7450 - was last revised on April 1, 2017. 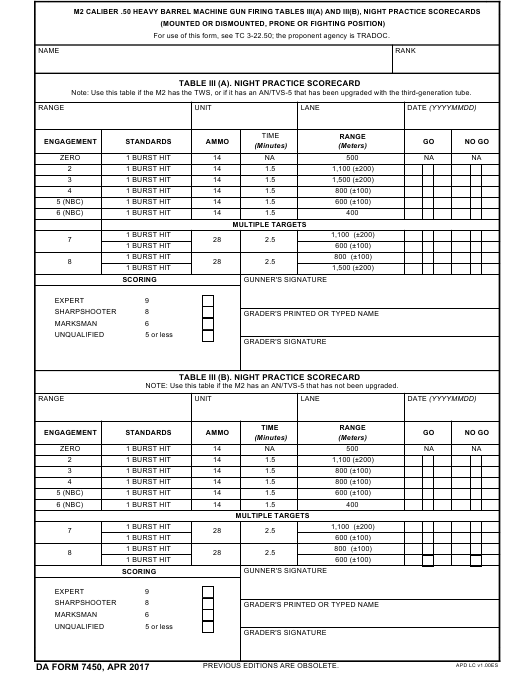 Download an up-to-date fillable DA Form 7450 down below in PDF-format or look it up on the Army Publishing Directorate website.